As I move towards having a 100% thrifted, vintage and me-made wardrobe, I have been wanting to knit a simple, sleeveless camisole for casual, everyday wear. Well, it’s summer every day here in Singapore! Of course, anything too plain would be too boring for me. So, something has to pop – either the yarn or the pattern has to have a bit of *jazz*. Fortunately for me, this little project ended up to be a little bit of both. 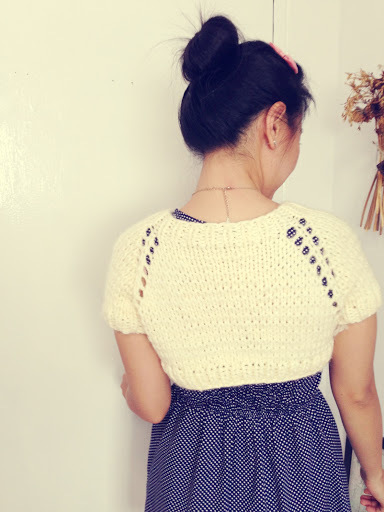 I made this basic tank top using a free Japanese knitting pattern by Pierrot Yarns (a Japanese company) found via Ravelry, with some modifications to the neckline and sleeve opening for an extra feminine touch. If you look again, you will also notice the twisted rib stitch. They give such an interesting visual effect and add so much texture to the final product. Spending time twisting the stitches when knitting it was totally worth it! The yarn is from a Japanese brand called Hamanaka, and this yarn is called Excel Silk. There’s a stash entry of it on Ravelry and it’s claimed to be 100% waterproof. To be honest, I have no idea what that really means. So… it doesn’t get wet? Anyway, I don’t think I will be washing it very often. The material feels cool to the skin and the stitches stretch out when I wear it. I barely sweat in it. I’m just gonna wear, hang, air/sun, and repeat! Modifications: CO 113 (instead of 115), add sc all around the armholes and neckline, then with 3ch between each sc the second round. P.S. : I still have a few balls of this yarn available, enough to make a matching bottom. I’m thinking about making a knitted pencil skirt with the same twisted rib stitch! What do you think? 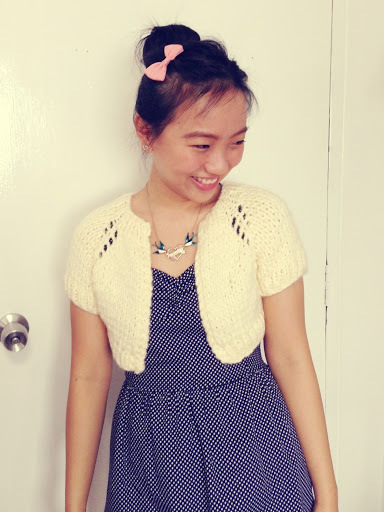 Last year, I wrote a blog post about a few vintage inspired knitting and crochet projects that I was planning to embark on. After completing a 1950’s inspired polka dot sweater, I immediately started working on the next thing that was on my to-make list – this 1960’s inspired crochet twin set. The pattern for this crochet twin set is from Patons Book 1318 Vintage Charm: Archive patterns from the 40’s to the 70’s, a pattern booklet I purchased from Spotlight (Singapore). I was initially tempted to make an identical one using pink yarn that is similar to the one used in the book, but I couldn’t find anything suitable in Spotlight. Every pink ball of yarn I found in the shop was wool, and wool is icky for hot and humid Singapore. Fortunately, I was shopping with a friend and she persuaded me to pick this sunny pastel yellow acrylic instead. I know, acrylic ain’t the best substitute but where do I find cool cotton yarn in Singapore!? Fibre aside, this colour was a great recommendation! I am glad that I listened to my friend and didn’t submit to my 16 year old mini-me on the left shoulder that screams for anything in cotton pink. Many of you may not know this, but I started blogging eons ago when I picked up knitting. My first blog was called “because she started knitting”. Obviously, my focus has changed significantly since. But… my knitting skills pretty much stayed stagnant because I was never confident enough to move away from hats and scarves. A while back I blogged about some vintage-inspired knitting and crochet books which spurred me to pick up my knitting needles once more. Fast forward many months later, this polka dot sweater is born. That’s 6 inches off the bottom! It took me about 2 months to finish this project, and then a couple more months to grieve over the fact that it was too long for my liking. After a tearful post on Instagram, I finally mustered enough courage to snip the bottom off and to correct the length. I took off about 6 inches from the bottom! I honestly don’t know how I ended up making a dress. Maybe I shouldn’t have steamed it with a steam iron. But I love how yarn looks after a bit of steaming. And then, after the length was fixed, I realised that I wished it fitted on my body better. Once again, maybe.. maybe I really shouldn’t have steamed it, because steaming relaxes the yarn. Happy New Year everyone! I hope everyone had a good Christmas and New Year’s. I was away for the entire month of December as I had been busy with my work and life in general. More importantly, I spent Christmas with my boyfriend in Texas and got to meet his family and friends for the first time! And because it was winter, I got to wear all the coats and hats and boots and everything that I haven’t had the chance to wear since I moved back to Singapore 3 years ago. But I still couldn’t resist knitting something new.. especially since I still have so many balls of yarn in my stash! I saw this photo of a vintage 1969 knitted hat featured in an old Bernat knitting pattern magazine and I was smitten! The hat looked like it was made with a bulky yarn in the photo, but I wanted to use my existing DK / 8 ply yarn, so I decided to improvise! I used this gnome hat pattern that I found via Ravelry as a base for my hat. Easy peasy! And is it just me or does the yarn remind you of chocolate chip and vanilla ice cream? Yum. Bacon and eggs scarf, very NSFW, innit? It’s been a long time since I made a scarf. 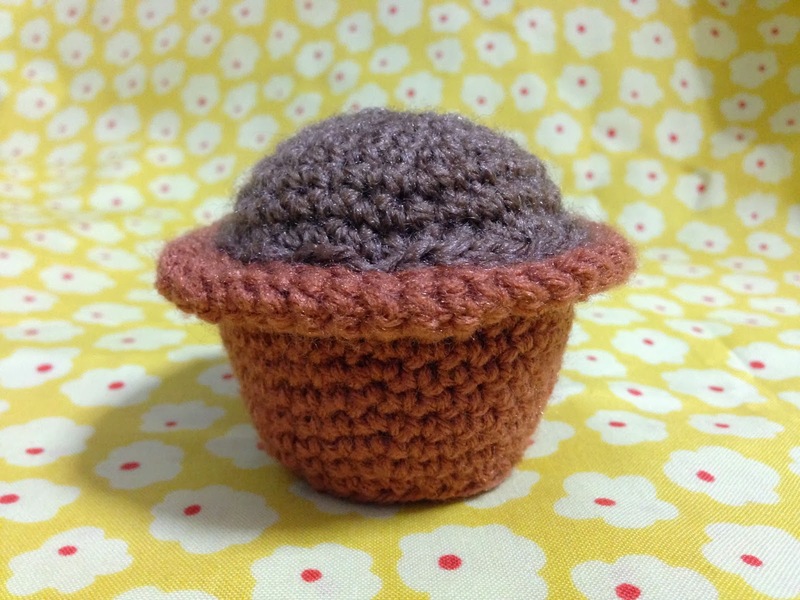 Actually, it’s been a long time since I made any knitted or crochet objects, really. And by a long time, I mean a looooong time. To be honest, I don’t think I have ever posted a knitted/crochet project here? Shame on me who previously had a blog called “because she started knitting“. This is long overdue project, a birthday gift that was promised to my friend over a year ago. Ah, better late than never. I whipped up this bacon and egg scarf on my own without following a specific crochet bacon and eggs scarf pattern out on the Internet. There are tons of versions out there and all you need to do is type “bacon and eggs scarf” into Google to get inspired. So, unfortunately, I have no pattern to share. All I can say is that this pattern was made using about 9 balls of yarn (x 4 red, x 3 beige, x 1 yellow, x 1 white), 5 days of recuperation at home from wisdom teeth removal, and 2 seasons of 2 Broke Girls. P.S. : If you like my bacon and eggs scarf, you might also be interested in checking out my knitted/crochet projects from the past such as the knitted pencil scarf and the knitted panda hat. I am also on Ravelry. If you like this, you can check out the crochet pattern that is available for free on the Lion Brand website here. And, as usual, I didn’t follow the pattern fully. I was meant to make crochet green leaves for the plant too, but I figured I wouldn’t have the space. I was right – I didn’t end up using a couple of flowers! 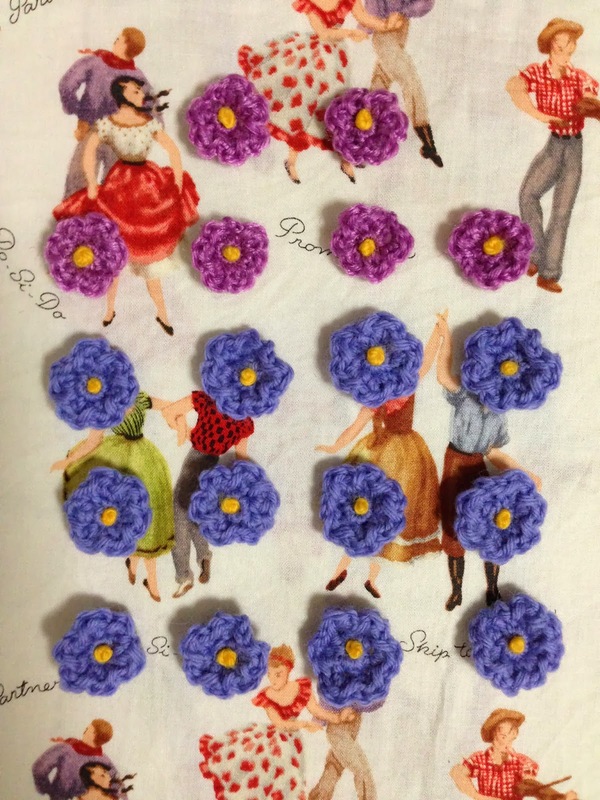 I made brooches with those leftover flowers. 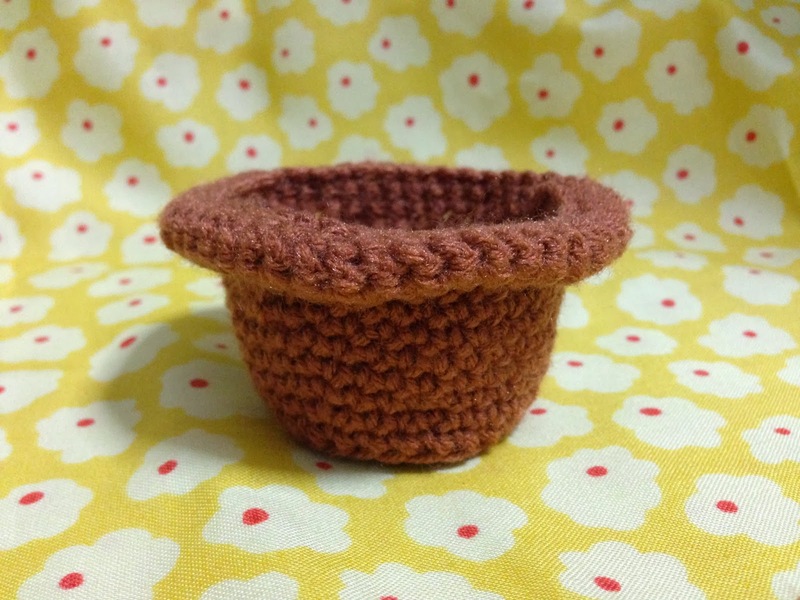 Also, I was meant to sew the flowers on the potted plant. But why go through the trouble when I have a glue gun sitting in my drawer? 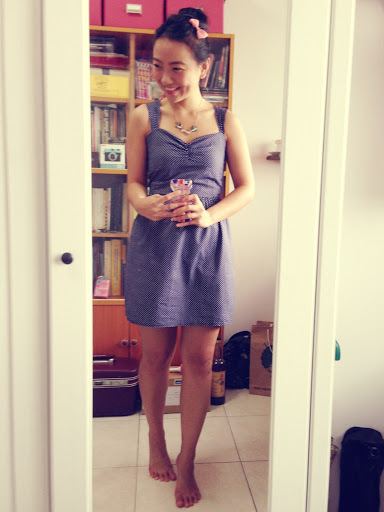 Last Saturday my few of my friends came over to my place for a mini afternoon tea and to pick out some of my old clothes. And it was then that I suddenly recalled this gem that I knitted about 3 years ago. Yes, this little thing was knitted over 3 years ago and it has always been sitting in my wardrobe. No, I have not worn it once. 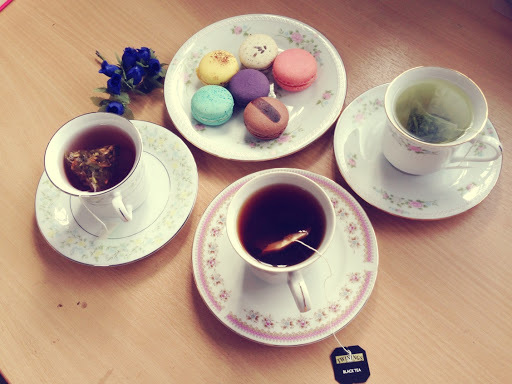 There was Twinings Prince of Wales tea, green tea and lemongrass & ginger tea. Oh, and there were macarons too. A quick search of my Ravelry account reminded me that this was made with a free pattern based on an original Anthropologie capelet. In other words, this is an Anthro-inspired capelet. Capelet, shrug, bolero. You can call it whatever you wish. And if I recall correctly, I made this bolero with just 1 (or maybe 2) balls of Shiver yarn (from Spotlight). It’s bulky and… on sale when I bought. Like… $5 or something. Geez, it’s time I pick up my knitting needles again. How I’ve missed those times. 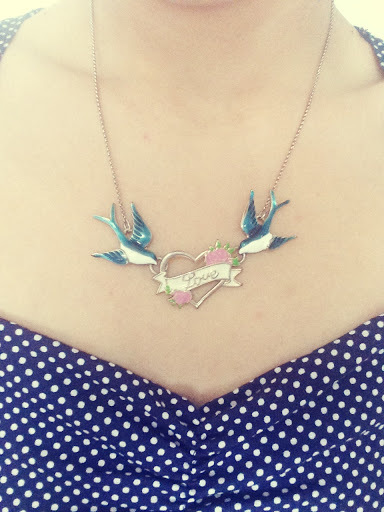 Oh, and I was wearing a polka dot dress that I picked up at a flea market a few weeks ago and my favourite traditional American tattoo-inspired necklace. Happy days!